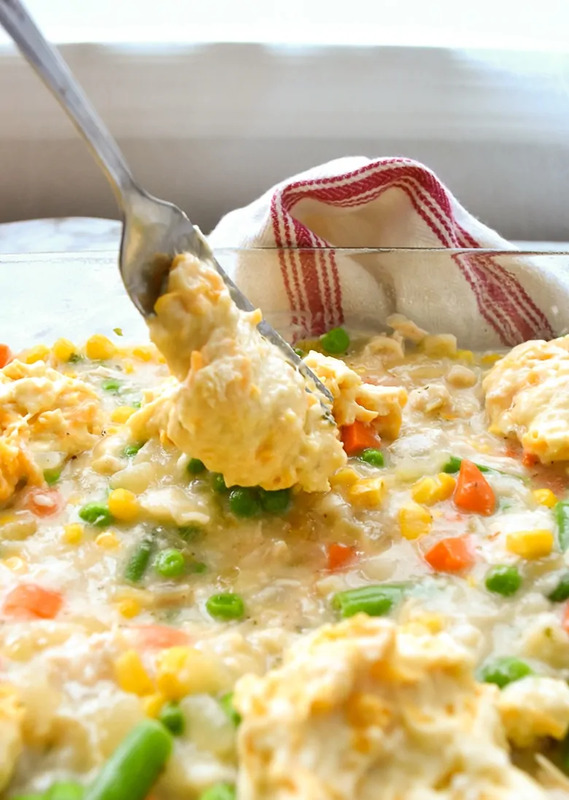 This chicken and dumpling casserole is a delicious take on a classic southern comfort food recipe that the whole family will love. I love casseroles. Not only because they are delicious, but also because they make mealtime easy. They don't require constant stirring or even for me to constantly be in the kitchen watching the stove. Once everything is in the casserole dish and in the oven, I can spend time doing other things. Plus, with casseroles we always have leftovers for the next night's dinner as well. Looking for a new casserole recipe idea to try? 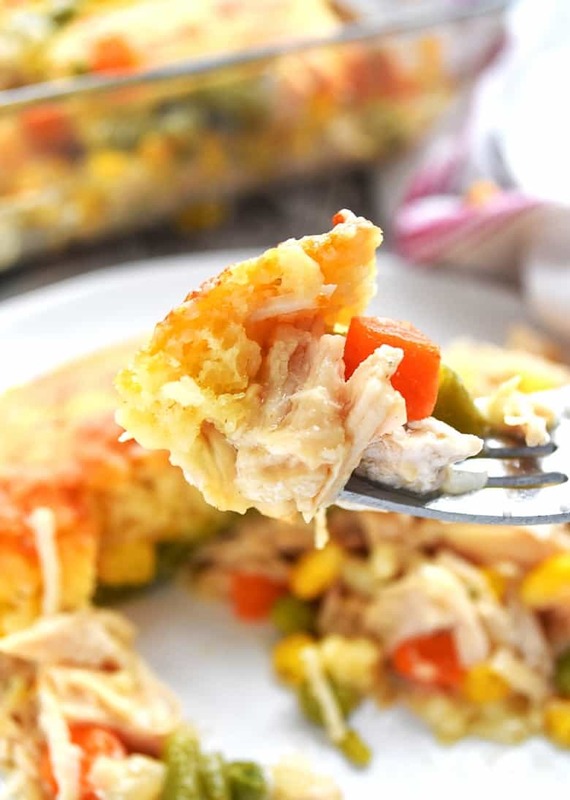 You are going to love this homemade chicken and dumpling casserole. 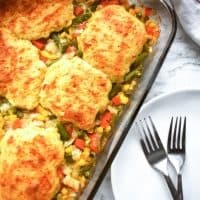 In fact this chicken and dumpling casserole is tied with my creamy chicken & rice casserole as the best chicken casseroles recipes I have ever had. 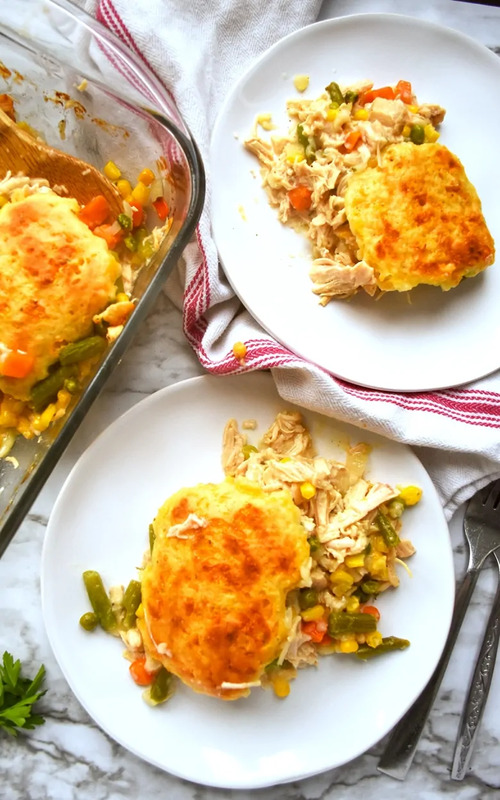 Whether you are looking for an easy weeknight dinner or something special to make for Sunday dinner, this chicken casserole will be perfect. 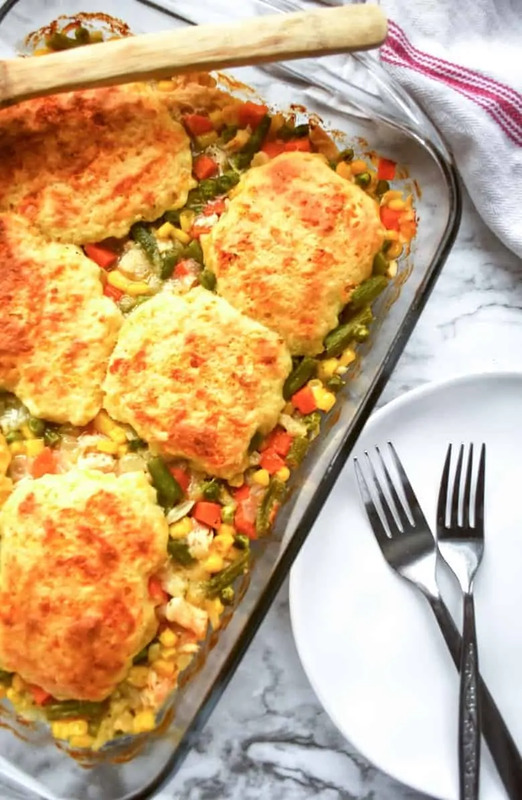 With chicken, vegetables a creamy sauce, and delicious dumplings, and this casserole is sure to be a crowd pleaser. Prep your casserole dish with non-stick cooking spray. Then, spread chicken evenly in the bottom of the dish. Next, heat butter in a large skillet and saute the chopped onion for about 3 minutes or until transparent. Stir in flour, mixing well to allow it to thicken. 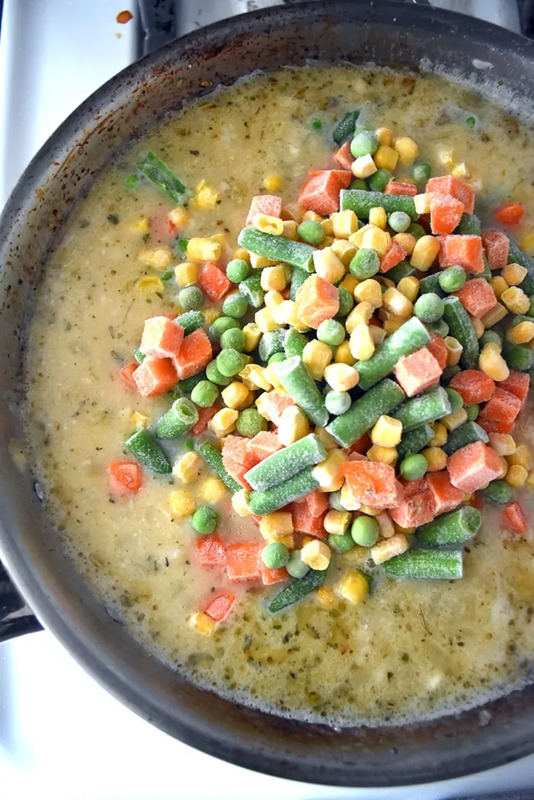 Add frozen veggies, broth, soup, cheese, and seasonings to skillet. Cook, stirring frequently, for about 5 minutes or until sauce is thickened. Pour the mixture into the casserole dish on top of the shredded chicken. Next, you will prepare the biscuit dough for the dumpkings. In a medium bowl, combine the flour, baking powder, egg, buttermilk, salt, seasoning, and cheese (if desired) to make the dough for the dumplings. Mix ingredients together until just moistened. Do not over mix. Drop dough by the forkful on top of the casserole. You can make your dumplings as large or small as you would like. Cover dish with foil and bake in preheated oven for 45 minutes. Then, remove foil and bake for an additional 15 minutes. If top of dumplings aren't a nice golden brown, you can broil the casserole (uncovered) for a couple of minutes. Allow casserole to sit for a few minutes before serving. That's it! 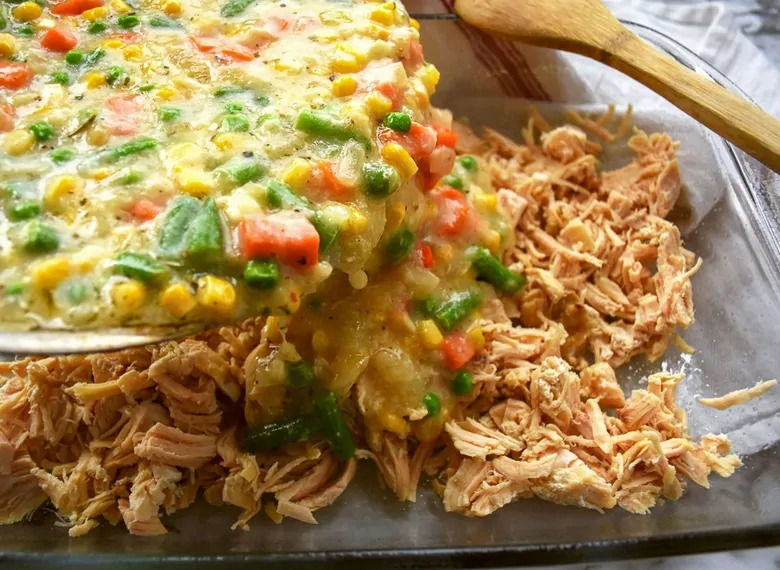 I hope that you and your family enjoy this delicious chicken casserole recipe. Spread chicken evenly on the bottom of the casserole dish. Heat the butter in a large skillet on medium-high heat, add the chopped onion. Saute onion for about 3 minutes, until transparent. Sprinkle the flour over the onion and butter, stir well, and allow to thicken. Add the frozen vegetables, broth, soup, cheese, and seasonings. Heat for about 5 minutes, stirring often until thickened. In a medium bowl, mix the dumpling ingredients together just until moistened. 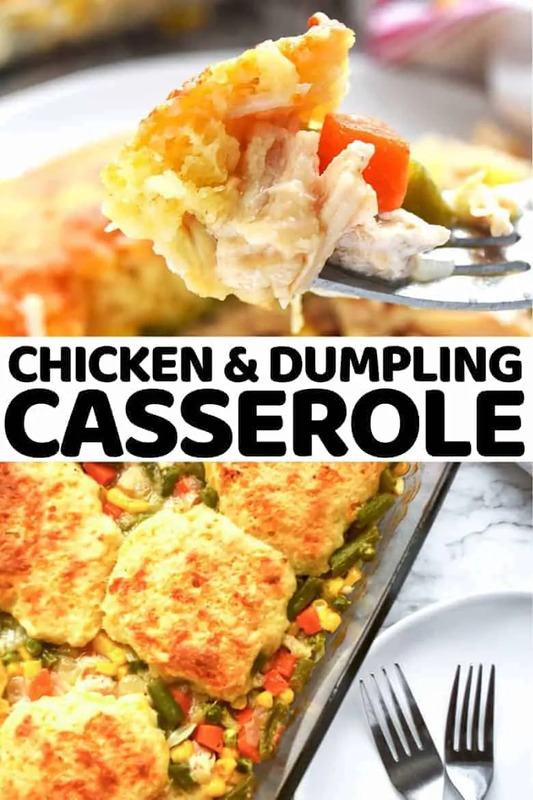 Using a fork, drop dumplings on top of the casserole. Drop by large amounts or small amounts, depending on how large you would like your dumplings to be. Cover with foil and bake for 45 minutes. Remove the foil and bake for an additional 15 minutes. I used a 15 oz can of Veg-All (drained) for the frozen veggies and a package of frozen dumplings (thaw first) This was real good and real easy!